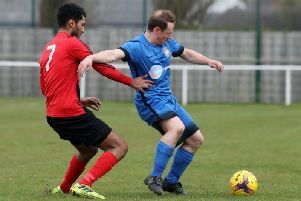 Desborough Town and Wellingborough Town are ready to do battle in a local derby at the Waterworks Field tomorrow (Saturday). And the clash sees two teams who have enjoyed fine starts to the new ChromaSport & Trophies United Counties League Premier Division going head-to-head. Having staved off relegation last season, the Doughboys are flourishing under boss Jon Mitchell and his assistant Stuart Goosey. A 3-0 success over Boston Town last weekend made it four wins out of five in the league before they made wholesale changes for the 3-1 defeat to Oadby Town in the UCL Knockout Cup in midweek. Ar Tarn are going along very nicely as well. An incredible game last Saturday saw them come from 4-1 down to beat ON Chenecks 6-4 and they then went on to defeat local rivals Rothwell Corinthians 2-1 in the UCL Cup on Tuesday night. Desborough boss Chris Bradshaw said: “It’s been a great start. “It was a crazy game in crazy weather last weekend but to come back from 4-1 down to win shows a lot about the character. “And then to go on and win on Tuesday night was very pleasing. “We lost twice to Corinthians last season when I felt we were the better team so to get that win against them was great. “It meant a lot to the people at our club and it means we carry on in the cup, which is a competition I want us to do well in. “Jon has done a great job over at Wellingborough, they’ve had a brilliant start. It’s his and Stuart’s first full season, it’s their team and we are under no illusions that we are in for a very tough game. “It’s too early to say that any team is ‘up there’. I usually wait until eight or nine games in before looking at the table because that’s when it just starts to settle down a bit. Doughboys assistant-boss Goosey, meanwhile, believes the Wellingborough squad are “proving a point” by their fine start that sees them sitting in second place going into the weekend. “It should be interesting because both teams are doing well and both will be feeling confident,” Goosey said. “We had virtually a whole different 11 out there on Tuesday and that’s not to take anything away from Oadby because they are a good, young footballing side. “But we are more interested in finishing as high as possible in the table. “It’s been a great start in the league and Jon and I were always of the opinion that the team we had in the second half of last season wasn’t a relegation team. “We have made some changes but we wanted to keep the majority of the team together and let them go and prove to the league and themselves that they can compete. “The confidence is high and that’s what comes with picking up some points, you start believing in yourselves. Having started the new season with three wins in a row, Rothwell Corinthians are now facing a situation where they will try to bounce back this weekend. Corinthians made a flying start to the UCL Premier Division campaign but their progress was halted by a heavy 5-0 defeat at the hands of Yaxley at Sergeants Lawn last weekend. They went on to suffer a 2-1 home loss to local rivals in the UCL Knockout Cup in midweek as a late goal condemned them to defeat. But joint-bosses Shaun Sparrow and Jim Scott may well fancy their chances of getting back to winning ways tomorrow. Corinthians make the trip to Wisbech Town who, somewhat surpisingly, have struggled in the early part of the campaign with just one win from their three league matches so far.